After a little experience most hobby orchid growers dream of crossing some of their better orchids to produce a prize-winning hybrid. It sounds so simple, just transfer the pollen from one flower to another, wait for the seed capsule to mature and then give the seed to a flasking service to propagate. Unfortunately, there’s many a slip “twixt cup and lip”. Having selected the orchids that you wish to cross, the first step is to remove the pollen cap from a flower on each and (usually) to prise out the pollinia (occasionally the pollen remains attached to the column). Then, taking care not to mix them up, you transfer the pollen of one flower to the stigma of the other and vice versa, using a tooth pick or sharpened match. If, at the first attempt, you succeed without the pollen falling off the toothpick into the pot and becoming lost, you’re less ham-fisted than me. Some pollen is sticky and easy to manipulate but some pollen (such as that from Australian native dendrobiums) is not, refusing to stick to the toothpick unless you first coat its point with some of the stigma’s sticky secretion (some hybridisers use their own spit!). At this stage it’s important to label each flower with the date and identity of the pollen parent, using a bread tag (for example), which you attach to the flower stem. For multi-flowered inflorescences it’s a good idea to pollinate several adjacent flowers, as this is said to promote the flow of sap and thereby aid fertilisation. Then it’s a matter of waiting for nature to take its course. 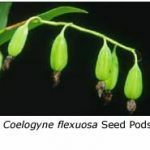 Depending on the genus, it can take anywhere between four weeks and a year or more for the seed capsule to ripen. Generally the seed capsules of terrestrial orchids ripen fastest, disas taking only six weeks. 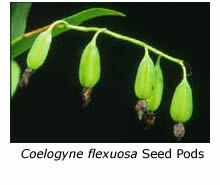 Cymbidium seed capsules ripen in about nine months, while sarcochilus capsules generally take more than a year. Unfortunately, nature’s course is far from smooth and many capsules never reach maturity. The first and quite likely event to happen is that the pollinated flower falls off the inflorescence within the first week, probably due to incompatibility between the two parents. Then again, the seed capsule may, over the next few months, appear to develop quite nicely before it falls off! One theory for this event is that it coincides with the pollen tubes, which may take several months to extend from the pollen granules to the ovules in the ovary, eventually reaching their target – which then finds them unacceptable! If the seed capsules are retained full term by the plant, they turn yellow and split longitudinally to release their seed. Being dust-like in character, the seeds promptly float away and are lost, unless you’ve taken precautions to catch them in a paper envelope or empty tea bag. Sometimes, seed capsules that have matured full term are found to contain nothing but fluff – again due to incompatibility between the parents. Having successfully collected your seed, you then send it to the flasking service to be told, in some cases, that they don’t like to sow dry seed! The problem is that the seed, having been exposed to the air, will almost certainly be contaminated with fungi and bacteria, and will therefore need to be sterilised before sowing. This is a tricky business, because under-treatment with chlorine or some other sterilant fails to kill all the contaminants, while over-treatment also kills the seed. The flasking service will usually tell you that it prefers to sow ‘green’ seed, obtained by harvesting the capsule a few weeks before maturity. In this event, the technician merely sterilises the outside of the capsule before opening it under sterile conditions, because the interior of the capsule and its enclosed seeds are naturally free of fungal or bacterial contaminants. Sounds easy, doesn’t it, until you ponder how you will decide whether the pod will ripen within the next three weeks, when in fact it may not ripen for another three months! You can get a general idea from the literature but that’s not foolproof – certain species of the same genus are known to take longer to mature their pods than others, and there may be even greater uncertainty in the case of some inter-generic hybrids. The smart way to determine the correct time to harvest ‘green’ capsules is to carry out pollination of your orchid at intervals two or three weeks apart. When the first capsule splits, then harvest the others and send them off for flasking immediately. What happens next? Ideally, the flasking service will find that your seed is viable in the mother flask and eventually ask you how many replate flasks you require. But sometimes your seed will fail to germinate or the seedlings will grow so slowly as to be worthless. Eventually, usually after a year or more, the seedlings in the replate flasks will be developed sufficiently to deflask. But that’s another story, best left for another article. Breeding your own hybrids is an interesting experience, provided that you have lots of patience and your temperament is able to withstand many disappointments. It’s not an exercise to be undertaken in the belief that you’ll make your fortune selling the seedlings – in most cases you would make a loss on the venture. Certainly, the time and expense involved is not worth the exercise unless you choose parents of high quality. Their progeny may still not be prize winners but you have a better chance than if you had used less worthy parent plants. Eventually, if some of your seedlings reach flowering size and produce flowers that do well on the show bench, you will find an undeniable sense of achievement. Should your particular hybrid (once it flowers) not have been made previously, then you can give it a name which (provided it has not been used previously and meets certain other rules) you can register with the Royal Horticultural Society’s International Registration Authority for Orchid Hybrids (at a current cost of £7.50). The names of all newly registered orchids and their hybridisers are listed in each issue of the Orchid Review ( UK), the Australian Orchid Review and Orchids Australia.